Well, I got my wish. In 9 days I will be drinking beer and surfing in Mexico! And the good news is, that’s just the beginning. The other good news is that we are traveling for anywhere from 3-7 months depending on a graduate school schedule and online classes (I love technology). I’ve been feeling particularly lazy and unmotivated to write in 2013. Maybe it’s the holidays and getting out of a routine. Maybe it’s my constant craving of change. Maybe I’m just lazy right now. Anyhoo, I am hoping that in edition to exploring, surfing, and spending quality time with my man I will be inspired to write. There is nothing more motivating for me than to travel and be in nature in the middle of nowhere. Not to mention, hopefully I will have hilarious travel stories. One of my favorite moments in traveling was when I had a layover in Taiwan. We were going up a required escalator to connect to a different terminal. An older Asian woman looked really apprehensive when stepping on the escalator. She got on and as she ascended, she slowly leaned back and fell back in slow motion and created a domino effect. At first I was concerned that she was hurt, but it was so ridiculous and surreal. I couldn’t stop laughing when I found out she was okay. The visual of people falling down an escalator like dominoes is something that will be etched in my memory forever! Visiting other countries is awesome and the actual traveling bit is part of the fun. One of the things I love most about travel is the random things you can’t plan or anticipate. 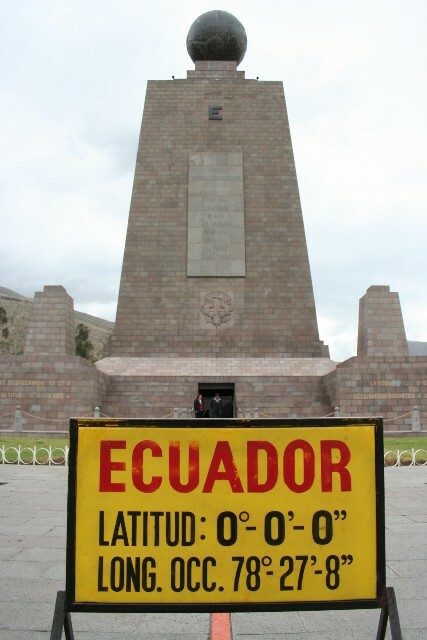 Side note: My boyfriend thinks I am the new Jessica Simpson because today I had the epiphany while looking at a map that the Ecuador, that it is on the equator. DOH! So I speak some Spanish but didn’t think about the meaning of Ecuador. Sue me. I guess that’s not as bad as my mom thinking Costa Rica is an island (after I had already visited three times). Leave it to a world map shower curtain to set the record straight. I plan to post at least twice a week from the road and we are also setting up another website for my boyfriend’s travel photography/travel info. Don’t worry, I’ll still maintain this blog and update you on any hilarious absurdities.